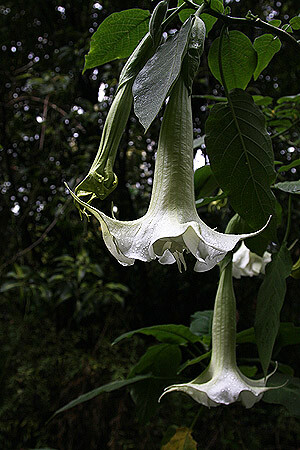 The common name of The White Angels Trumpet is a little misleading as a number of plants seem to be called by the same name. They are related however they are also different. All make excellent garden plants, however the growth habit differs from a small shrub to a 15 - 18 ft tree. All will grow well in a humus rich moist but well drained soil in sheltered positions. The Datura will not cope well with cold as well as the Brugmansia. In general the trumpet shaped white flowers look similar, however we look at three different plants that earn the name. Very large white flowers with deeply incised petals.The foliage is long and lance shaped, said to be one of the sacred flowers of the Incas. So take your pick, the plants are very different however they all have 'White Angels Trumpet' flowers.